The overall creative vision was set by Director Rian Johnson, with "The Empire Strikes Back" as the general reference for the look and feel, one that was "historic and lost". 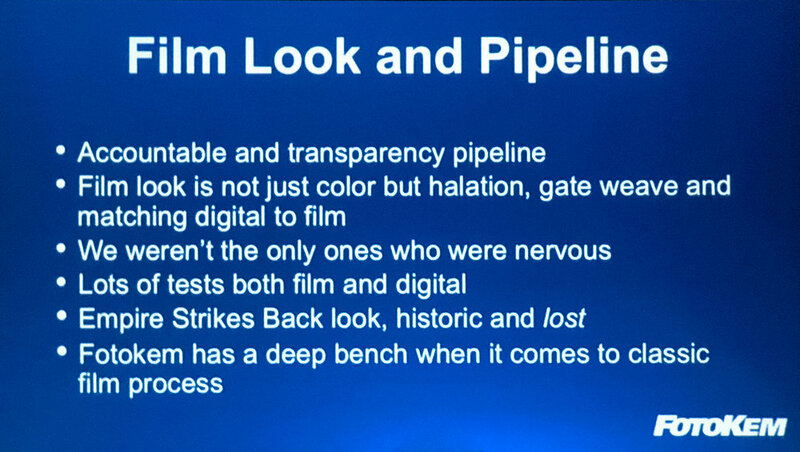 Director of Photography Steve Yedlin executed Rian's vision by implementing a highly technical and "evidence-based decision process" for implementing a film look and pipeline. The film was shot on a combination of 35mm film, 65mm film, Arri Alexa, Alexa 65 and Sony F23. The film look wasn't just color but halation, gate weave, grain and matching to the numerous digital cameras used alongside traditional celluloid. Respect the cinematography - don't adjust contrast unnecessarily and needlessly "for the sake of it", as that does not respect the cinematographer's original intent. Use the visual language of cinematography - a colorist is similar to a virtual cinematographer, in that they should manipulate the image in a way that emulates how it would have occurred if done in-camera \ on-set. 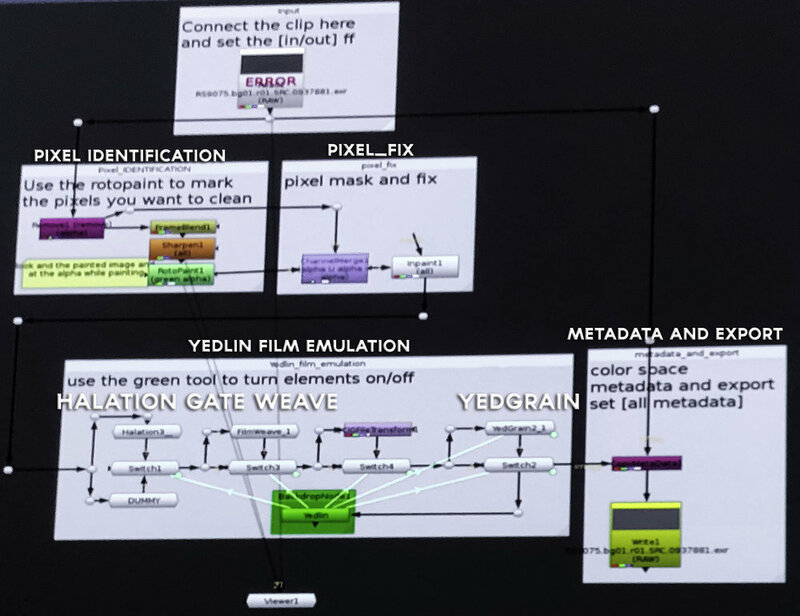 For the dailies work, the team used RGB CDLs (color decision lists) only as Walter emphasized they did not want to "fix problems in dailies color". The production relied heavily on Fotokem's nextLab on-set DIT workstation system to create deliverables for VFX, the studio, DP, and Director. The team needed to perform a few tests on-set in order to ensure everything looked okay going forward. With HDR distribution becoming more common, so they monitored on-set in HDR for about a week before feeling confident enough to move forward with traditional SDR on-set reference displays. 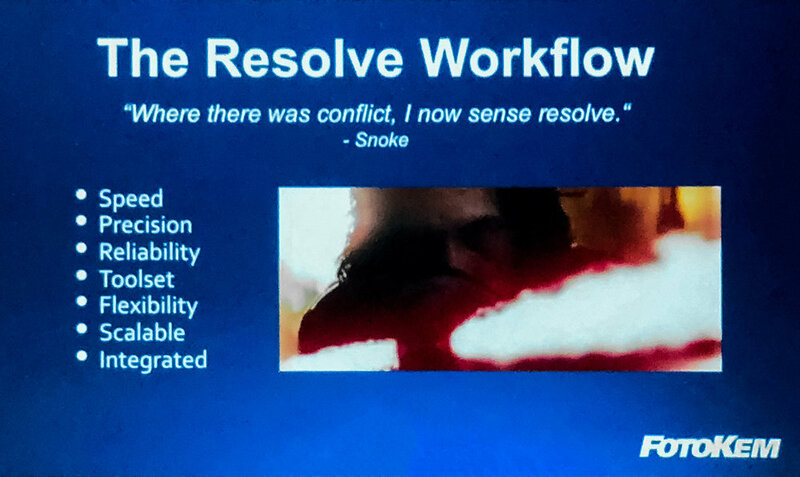 As we got more into the workflow methodology, Walter shared that all major (color) decisions were made in the first two weeks and they used an "answer print" method of coloring remotely at Skywalker Ranch in Northern California, syncing with Fotokem's servers in Burbank 600 miles away. DI Editor Phil Beckner manned the Resolve workstations in Burbank while Walter was working on-site at Skywalker Ranch. Editorial was located in Pinewood, Burbank and Skywalker Ranch. The collaboration between Phil and Walter was especially critical, as Phil was taking care of all non-color tasks in the same project, while Walter was working on color simultaneously and both were getting real-time feedback from the client. They had the additional responsibilities of grading all the tv spots, trailers, behind the scenes documentaries, and deleted scenes, "cause its bloody freaking Star Wars", per Walter. Phil took on the color tasks for the BTS documentaries, which you can view on the BluRay & DVD or streaming. The team used three start-of-the-art DaVinci Resolve workstations, each with six Nvidia Titan XP Graphics Cards and 20TBs of local storage, with one workstation dedicated to nothing but rendering, review, and QC duties. The show used a full OpenEXR workflow for both 2D & 3D deliverables. Fotokem used a Nuke render farm directly connected with the SAN for film emulation, grain, localization, titling and more. Nuke was used because it could be set up in a render farm configuration and because it was "open and configurable". Walter graded the film in Blackmagic DaVinci Resolve 14. The team took a very interesting approach to Quality Control, which took place over three parts. The first level of QC (QC 1) was done immediately after the film was scanned \ cards ingested into a Resolve workstation, where it was put through an HDR pipeline in an attempt to "break it before anyone else sees it break." The team used HDR to "amplify any possible image issues" and addressed them immediately. Any dust or scratches were cleaned up in Nuke at this phase, which you can see in the node graph above. The second level of QC (QC 2) is a single HDR10 export out of DaVinci Resolve, which was QCed at DIsney and in-house at Fotokem. Every subsequent version originates from this master HDR10 "QC root" file, appropriately dubbed "The Mother". This workflow allows for easy propagation of fixes throughout all the masters by simply fixing "The Mother" and recreating everything down the chain. The third level of QC (QC 3) occurred when creating all the localized versions along with the huge variety of final deliverables for home video and streaming releases. The deliverables list for large studio tentpole features is usually quite extensive, but for a Star Wars film it was on another level. Just for the theatrical deliverable, I counted eight different variants (and I'm sure I missed a few). They also had to prepare the Blu-Ray (Original Aspect Ratio + 1.78), UHD HDR Dolby Vision and HDR10 (O.A.R), 3D HD (O.A.R), UHD (O.A.R) deliverables as well. Everything also had to be done in more than 40 different languages, just to make things a little bit more complicated. Walter's Node Structure in Resolve, which was consistent over every shot (even tho most were rarely used). "Designing resiliant workflows and habits"
"All in a foreign country with no office on international hours"
Thanks again to Fotokem Colorist Walter Volpatto & Color Scientist Joseph Slomka for the amazing information that made this breakdown possible.